Krista Parker is a former Associated Students Executive Officer at San Diego State University. She graduated in spring 2012 with a degree in political science and jumped right in to working on the reelection campaign of President Barack Obama. Following is her account of what that experience was like. On July 14th, I jumped on a plane to begin the crazy adventure of campaign life- my destination Virginia Beach, VA. As one of the most important battleground “states”, I say state in quotations simply because VA considers itself a Commonwealth still to this day, VA was the place to be for this roller coaster Presidential Election and I was the lucky one who was able to sit in the front! While in Virginia Beach, my role as a Field Organizer resulted in sleepless nights, stressful situations and pressure that is on the border of being scary. No day on the campaign was ever the same however our ultimate goal was consistent … win. That process was centralized around three types of communications: phone calls, knocking on doors and getting people registered to vote. I was responsible for seven voting precincts and the majority of those precincts had voted Republican back in 2008 so the difficulty level was high but the challenge was accepted. I met so many people on this journey ranging from the 78 year old woman who couldn’t read therefore had never registered to vote because nobody would help her with the form, to the man who lost his job because it was shipped overseas. Every person we talked to had a story of why they supported our candidate and every person had a vote. On September 27th, I had the honor to meet the man I was working so hard for – President Barack Obama. I could use the cliché line of “this was the best moment of my life so far” and I will. We held a campaign rally in Virginia Beach that resulted in approximately 7,000 people to show their support for him. After he spoke, he walked around the crowd shaking hands, taking pictures and talking to the voters. This was my chance to thank him for everything he had done for the country and for me as a woman and student. He made his way around the curve and he shook my hand. His famous campaign quote came out of my mouth “Don’t Boo, Vote” he came in closer and replied “What did you say sweetie?” I repeated myself a little louder and slightly more confident and he smiled with a response “That’s right, Don’t Boo, Vote. Thank you for what you are doing for this country” THAT was the best moment of my life, so far. From July until early October, I spent most of my time developing teams to work as hard as possible during the final push – Get Out the Vote (GOTV). GOTV was by far the most exciting time on the campaign because everything started to fall into place. The polls didn’t matter in my eyes and I had to stop even looking at them as we started to inch toward November 6th. The days leading up to the election resulted in horrible fast food, absolutely no sleep and many trips to 7-11 for energy drinks. Think of finals week but far worse. Walk packets had to be prepped, scripts have to be crafted for volunteers and everything had to be perfect or you risk failure. We were lucky enough to have the best teams, the best voters and the best system – that resulted in an election night projecting our candidate Barack Obama the winner of the 2012 election. Nothing is perfect. At some of our precincts, we had people waiting in line for 10 hours to cast their vote for the President in the pouring rain. We had systems that were meant to prevent any large problems and they were successful. We had worked for months to get to this moment. Our work had paid off and the President was re-elected. It was draining and exhausting but on election night after all the polls had closed and the results were final, it was all worth it. Four out of my seven precincts voted Democrat and voter turnout increased drastically. One of my precincts ended up having a seven vote difference, in favor of the President. That is the direct effect of a ground team and that is what won the election for the President. Many have asked me “would I ever do this again?” My answer stays the same, I don’t know if I will ever connect with a candidate the same way I did with the President. I can’t imagine doing this for a candidate that I didn’t fully agree with their policies or their politics. The President is someone I supported and was willing to work 20 hour days for 7 days a week and to find a candidate like that will take time. The friendships I have made and the experience is absolutely priceless, so on that note, if the opportunity presents itself and one truly believes in a candidate, jump on the campaign while you can still operate in “college” like conditions. The outcome is worth it! No matter when you attended San Diego State, in recent years, one of the highlights of the spring semester is the annual festival put on by Associated Students. When I was an undergraduate student, it was called Spring Fiesta and AzFest. Fast-forward to 2012 and that festival has morphed into GreenFest, a week of events celebrating sustainability — a core value of Associated Students — and Aztec pride. Associated Students has worked hard to green its facilities and promote programs that espouse an eco-friendly lifestyle in recent years, and GreenFest is no exception. To learn more about Associated Students’ sustainability efforts, visit as.sdsu.edu/thinkgreen or the GreenFest website, “like” Green Love and GreenFest on Facebook or follow GreenFest on Twitter. 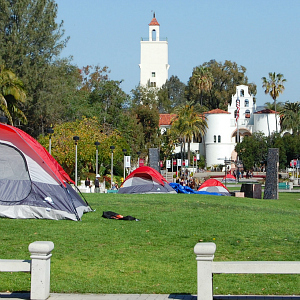 Students camped out on Campanile Walkway for prime campaign signage spots. While many attribute the madness of March to the NCAA men’s basketball tournament, many SDSU student leaders deal with another, more personal, version of it, as well. Just last week, SDSU students elected a new group of executives and college representatives for Associated Students for the 2012-13 academic year. And it’s no “simple” election — as part of the process, students sit through orientation meetings, sleep outside overnight to stake prime campaigning sites and debate their opponents in an open forum. Even then, the slim margin between victory and defeat can be as thin as a dozen votes. This is outside of their normal lives as students, too. There’s still midterms, part-time jobs, volunteering during Explore SDSU, and cheering on men’s and women’s basketball. But, that’s what makes these students leaders — their commitment to campus, their classmates and the San Diego community is what sets them apart. They’re advocating on behalf of students, overseeing the many facilities and services students enjoy, and partnering with other organizations to help the San Diego community. If the “madness” of students’ busy lives seems a bit much, just remember the end of March is just around the corner — and spring break along with it. One of the most powerful forms of media is video. I’ve heard it called the “You’ve got to see this” factor, that transcends language. If a video is fun, funny, unique or moving, people will watch it, share it, comment on it — and it will help get your message across in a powerful way. As a professional in higher education, I particularly like to see what other universities are doing when it comes to video. So following, in no particular rank or order, are 6 of the best university videos that I found from 2011. San Diego State University – I’ll start with our own. We’ve gone away from the typical institutional television spot showing faculty members in labs coats and tried to do something a little more fun, that shows both the passion of our alumni, and the reach we have into the community. Our institutional spot focused on a chant that the student section does before every home basketball game – “I Believe.” The commercial features several prominent alumni, including the founder of the Rubio’s Fresh Mexican food chain, Ralph Rubio, and the mayor of San Diego, Jerry Sanders. But the best part is what we did after the commercial debuted. We were able to get Mayor Sanders to join the student section before a game to lead them in the chant. And we captured it on a smart phone (Not all videos need to be professionally produced to have impact). But the video was a hit and shows the excitement and atmosphere at our games. Boston University – Boston Red Sox, Behind the Lens. We all like to share stories about our successful alumni. BU does a great job on this feature, shadowing this sports photographer as he shares his experiences taking pictures at historic Fenway Park in Boston. The production value of the video is outstanding, very creative, weaving in still photography, making it look as though it’s moving. And the story is compelling, like something you might see on a network sports show. University of Toledo – #whyUToledo. This is a great example of an integrated approach to new media. It started as a Twitter campaign, asking people why they chose UT. Then they took the images of the actual Tweets and made a video out of it, with voice overs of (supposedly) the students reading their Tweets. Really fun, forward thinking, great way to connect with the generation that is currently looking to go to college. McMaster University – This Month with the President. While this is a very simple concept, execution is not always as easy. McMaster sits down, in a different location, each month with the president of their university and has him discuss a particular topic. It’s not scripted, there’s no teleprompter. It’s just him sharing his thoughts. It’s a great way to personalize someone who, often times, people on campus don’t get to interact with. University of Oregon – Call me a Duck. I’m a sucker for Hip Hop songs being used in non-traditional places. And this one is outstanding. It’s actually sung by an a Capella group from UO that went on a national television singing competition show. It’s an amazingly well produced music video that shows school pride, passion and creativity. Bowling Green University – Stroh Center Rap. One of the challenges in the Advancement and Development world is educating people – particularly students – about the importance of philanthropy to a university. The typical introduction of a newly built and/or named building is a press release and a ribbon cutting ceremony with a photo opp. The opening of Bowling Green’s new basketball arena, The Stroh Center, was anything but typical, thanks to this video. The rap talks about the people who made the building possible, including how much money they gave. — “He will melt your face with his philanthropy” — And the video features those donors. The production value of the video is excellent. But for my money, getting the donors to participate in the video is well worth the watch. What great university videos did you produce or see this past year? 10. Stephen Weber – for 15 years, President Weber was the identity of our campus – and our most effective storyteller. He transformed SDSU and left us with incredible momentum. 9. Elliot Hirshman – SDSU could not have found a better president. He has brought new energy, passion, humor and a laser focus on student success. 8. Steve Fisher, Beth Burns, Rocky Long, Tony Gwynn and all SDSU’s outstanding coaches – SDSU would be a great university without a great Athletics program but now we’re on the verge of having both. Beyond building successful programs, these incredible people work daily to shape outstanding citizens. 7. 69,000+ applicants – I guess we’re doing something right! Seriously, California has many talented young people filled of hope and enthusiasm for the future – let’s not let them down by closing the door on their dreams of a university education! 6. SDSU’s incredible faculty – they continue to bring accolades for their outstanding work and $150 million in research that has elevated SDSU to be among the top public research universities in the U.S. On the downside, I have to go to work knowing I’ll never be the smartest person in the room! 5. Our students – they are why we are here! A lot has been written about the current generation’s short-comings – don’t believe it. From what I’ve seen, our future is in good hands. I’m especially impressed by the accomplishments of our student leaders in the areas of sustainability and social justice. 4. SDSU’s donors who have enriched SDSU with $280 million to The Campaign for SDSU. SDSU would be a far different place with their investments in our talented people, nationally ranked programs and beautiful facilities. Thank you 280 million times! 3. Our hard-working staff – they look after our students, fix our computers, protect the campus and keep it looking amazing. While the jobs vary, they share a belief in the power of a university to change lives. 2. My team – through their efforts, the MarComm team is helping transform the image of 114-year old university and engaging more people in powerful new ways. 1. My family – for putting up with the 3 a.m. phone calls (which are never good) and generally supporting me through all the adventures that come with the job. It helps that my wife Lucita is an Aztec alumna! I’m tempted to add that I’m thankful for the delicious cookies baked by Aztec Shops – which have got me through many long meetings. Instead, I’ll close by thanking our troops for keeping our country safe and allowing us all to live our lives in freedom. Peace to all! 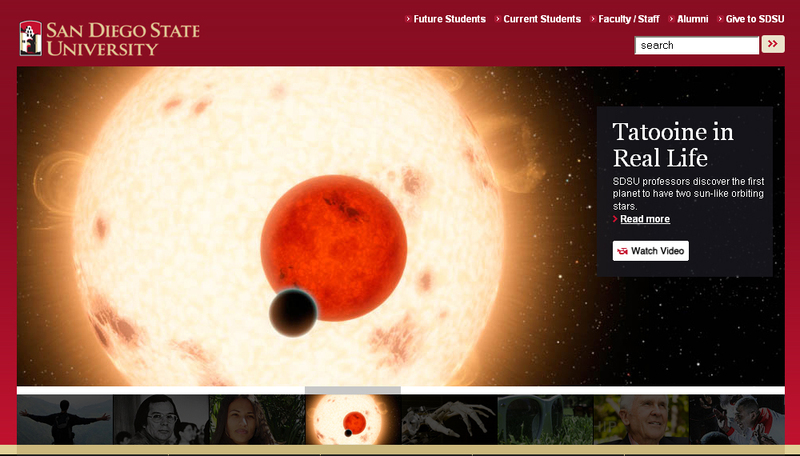 The top part of the SDSU homepage features the terrific efforts of our students, faculty, staff and alumni. It’s a tough question to answer, if only because the people here do so many interesting things and I don’t want to unfairly pigeonhole the university with a clumsy response. Thankfully, my job requires me to identify SDSU’s best stories and retell them on the homepage. The top part of the page is dedicated to the terrific efforts of our faculty, staff, alumni and students – especially students. And we’re always looking for more good stories to tell. Tatooine in Real Life — SDSU professors Jerome Orosz and Bill Welsh discover the first planet to have two sun-like orbiting stars. Better, Faster, Stronger — SDSU engineers work to invent brain-controlled bionics. The Gift of Sight — SOLO Eyewear, a company started by SDSU students, uses revenues to provide eye surgeries and prescription glasses to people in need. Worldly View — Eric McDermott investigates Huntington’s disease in Bangalore, India, at the National Institute of Mental Health and Neurosciences. He’s part of SDSU’s surge in Fulbright scholars. American Indian Inspiration — Generations of local American Indian leaders celebrate the 35th anniversary of one of the first academic departments dedicated to the study of their history and culture as means to create a better future for their people. If you’ve got a great story, please drop me a line at ahoskins@mail.sdsu.edu. Right now hundreds of thousands of high school seniors and junior college transfer students are filling out applications to go to a university somewhere. Each year San Diego State University is among the nation’s leaders in the number of applications it receives. Not all that are admitted end up coming to SDSU. 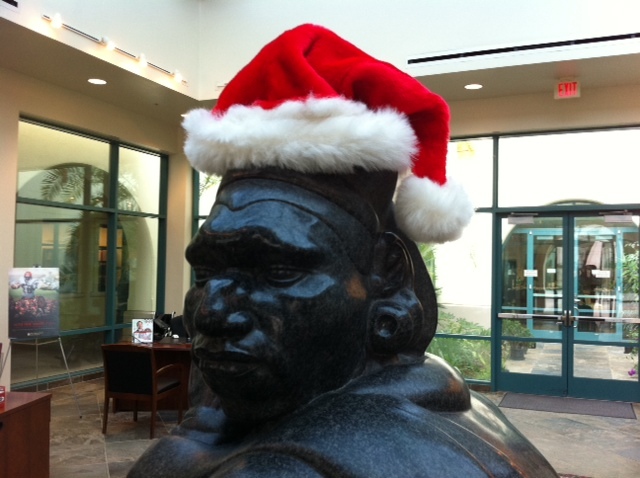 But of those that do become Aztecs, most become passionate Aztecs for Life. 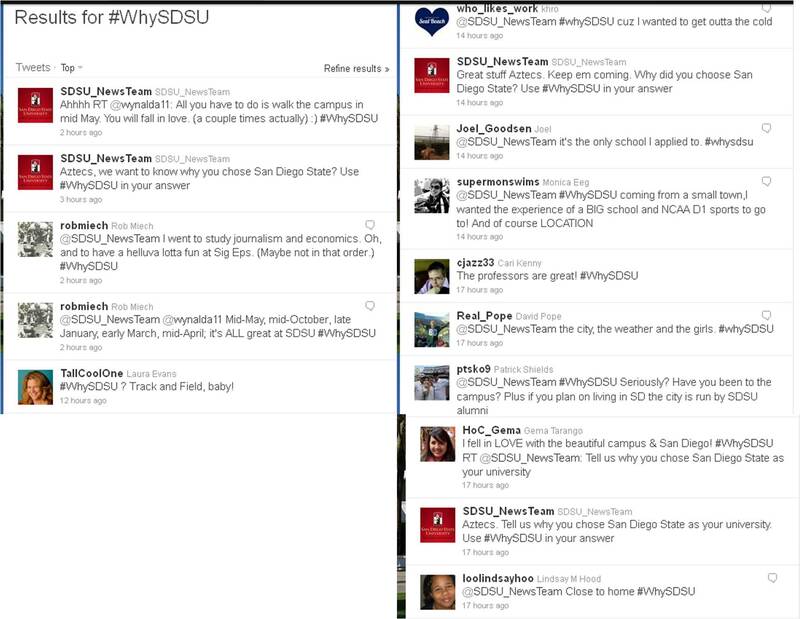 @The__Show: #WhySDSU : More combined wins in football and hoops than any other school in the country. But even besides the wins, we have sooo much fun.